Wrap up in the night sky with Emily Fischer's timeless quilt inspired by our miraculous universe. Laying underneath the stars: awe-inspiring. 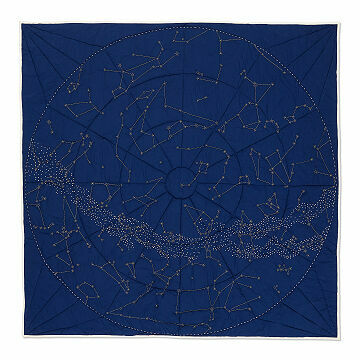 Laying beneath this constellation blanket: completely serene. Emily Fischer"s galactic quilt is as close as you can get to wrapping up in the constellations, from Orion's Belt to the Little Dipper. Inspired by our universe's remarkable magnitude and the delightful simplicity of stargazing, Emily thought to create the unique design. See how the bright white stars nearly vibrate within the soothing deep blue backdrop. Strewn across a bed or couch, it brings timeless beauty to a nature lover's or zodiac devotee's home. Handmade in India. Like many New Yorkers, Emily Fischer didn't start out here. She grew up in a small town in rural Wisconsin, then studied architecture at the University of Michigan, where she won a host of academic honors and awards. A few years later, she took a job in the Big Apple as an architect. Emily also runs her own design business—you know, because she wasn't busy enough. Her works span from huge kites that look like ships to quilts featuring coastal shorelines. In other words, she's kind of a magician. You can find Emily working, designing, and working some more in Brooklyn. I loved how unique this item was! Thought it was a bit thinner than I was expecting, I still love it! It's comfy and great to wrap around yourself in.